So many lights. Let’s just say that Las Vegas is not my favorite place to visit. However, I had not been to the booths at HIMSS in 4 years and I decided it was time to go. The last time I went to HIMSS, it was in Las Vegas so, I was familiar with the layout of the Exhibit Floor. Somewhat daunting: two levels, the big shows upstairs and booth after booth downstairs – over 1300 leading health IT vendors! Having to go through a security turnstile just turned me off so I didn’t go into the “educational” showcases on the exhibit floor. What did I miss? So many education sessions. The HIMSS online information on the educational sessions was pretty easy to navigate. Because of time and distance, I ended up going to only two of the 300 sessions offered. The sessions I did attend were really good. I was interested in the changing data associated with Accountable Care, Episodic and Bundled Payments and how we are going to merge the data of hospital provider and multiple visits covered by one combined clinical episode. I found some good insights. The good news is that I can access most of these education session recordings online for the next year. I wonder if HIMSS would consider doing an educational-only national conference? So many booths. 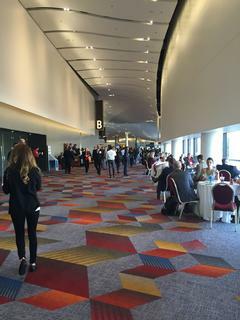 Last time I was at HIMSS, there were just over 900 booths. Now there are 400 more. Yikes, that’s over 1/3 bigger and it was already big. I did a search of the online conference planner and made a list of about 40 booths to walk by or visit. I focus more on software content and how it is used to help hospitals in their operations - a different focus than that what I found at the booths. What work really gets done in those booths? They were full of graphs and screenshots and LED screens and giveaways. It’s great to see the size of the big players, the new vendors and the booths that are steady and delivering their products consistently. So many footsteps. 1.3 million square feet of exhibit space to be exact. Okay, so HIMSS is for the young at feet. You don’t see too many gray hairs wandering the Exhibit floor. My best days were in comfy sandals. I’ve learned to carry the little pocket book and to mark it or create a list of the booths that are on my HIMSS bucket list. It was interesting to see the latest Mega booth (ahem, Cerner at 3000 square feet takes the prize) and to see who is missing. Where did Axelotl, MedAssist and Eclipsis go – I know, they got acquired but could it be that’s the way to get acquired – have a big booth, great SWAG, a big party and have a VC say, “Hey, I want some of that!” I still have my Axelotl key chain with the purple gecko – love it. So to dinner is just where I went. My husband and I enjoyed a great meal with Mark Griffin and his staff (Lauren, Tyler, and Clint.) of Blue Eagle Consulting. The conversation was real – we talked about software, consulting, chickens, the Navy and healthcare. It was easy, relaxing and informative. The sweet spot of the event. I hope to do more business with those real folks. So many contacts. I resisted the urge to accumulate a mass of business cards as I have in the past. I did come away with about a dozen or so that I really want to follow up with on a personal level. One of the highlights of HIMSS for me is always the Small and Independent Consultants’ Special Interest Group (the SIC SIG). I first attended this session in 2005, and from 2006 on, I have been involved in a leadership role. A few of us have worked together to lead this group, sharing the chair and co-chair responsibilities. This year the chair, Michele Clark, couldn’t make it, so I led the meeting. I got the idea to Skype her in, so we had her in “talking head” mode on the big screens. Though she didn’t see the group the entire time, she was able to listen and provide input. It was great fun. We had the usual 50+ attendees and shared our accomplishments and vision. The diversity in IT healthcare consulting is amazing - from independent contractors who are specialists in a technical field to visionary management consultants and authors. We have a great group. It makes HIMSS feel like home. Michele, Tammy and I have decided to turn the SIC SIG reins over to someone new, yet to be determined. Over the past decade, we have had a great time helping new and old consultants to stay connected to each other and healthcare horizons. We started our own LinkedIn Group to help consultants stay connected. Check out Healthcare IT Consultants which now has 2,357 members and is growing. We allow postings of talents, jobs, and pertinent healthcare IT news and information. We will continue to maintain that group and perhaps have more time to invest in its growth and usefulness.